State, or of the Commonwealth, or of a State. This means that anyone who was born or naturalised in Britain or a British colony and who has lived in Australia as a “resident” for at least three years is qualified to sit in Parliament. According to S.34 it appears they don’t even have to be “naturalised” Australians. 1. Is the United Kingdom a “foreign power”? According to the Australia Act 1988 it is, but as the Act was never ratified by We the People voting in a referendum it appears to be invalid. THE CONSTITUTION CAN ONLY BE AMENDED BY WE THE PEOPLE VOTING IN THE REFERENDUM. 2. Is the naturalisation ceremony that people must undergo to because Australian citizens valid? The Constitution does not mention it. Of course, the Parliament passed an Act to mandate the ceremony that includes the person taking an Oath of Allegiance. The Oath reads, “I, A.B., do swear that I will be faithful and bear true allegiance to Her Majesty Queen Victoria, Her heirs and successors according to law. 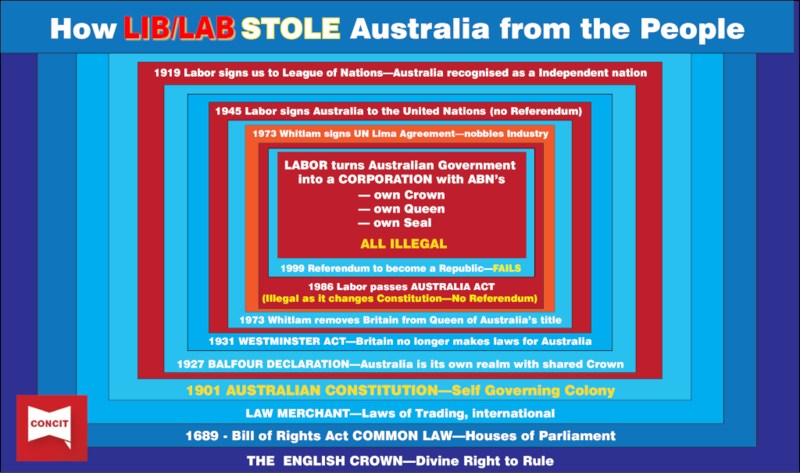 But once again we have a problem, because the Australia Act severed any allegiance to the British Queen. Instead, it tried to create the “Queen of Australia”. So, as the UK is supposed to be a “foreign power”, who is the Queen of Australia? This is why CIRNow is advocating reforming the whole government system. We the People should have the right to decide how we want to be governed, and the only way we can do that is by having the power to start (initiate) referendums to amend our Constitution….Citizens Initiated Referendums (CIR). We have a 5-Point Plan to achieve this goal. But it depends on the people of Australia understanding that ONLY WE THE PEOPLE HAVE THE POWER TO GOVERN OURSELVES. The Political parties do not have any power under the Constitution. Only we give them power by continuing to vote for the representatives they choose. In fact, the Constitution doesn’t even mention political parties, or who should become PM. The only official mentioned in the Constitution is the Governor General acting as a representative of the Queen. But which Queen? If we want to stop the political parties it is up to us to stop voting for them. We need to change our ways first. This is how we propose fixing the problems…. Implement Service to the Nation to help protect our nation and supplement the ADF with a trained civil defence force, including a requirement for all equipment to be manufactured in Australia. This will boost manufacturing and create new jobs for all. Until Australia changes the way our government works, and makes the politicians directly accountable to We the People, we will continue to suffer the same indignities and loss of rights and freedoms. All Australian voters have the right and the power to change the system. It’s up to each one of us! A well presented opinion by Mike Holt, this information article piece is perhaps the only means of escaping from the tyranny of the Federal government political parties that invariably fail to consider the people of Australia. Already the mainstream media are just presenting the media news acceptable to the particular political party that holds the leadership of our nation. This factor of selective published/presented news articles has proven its corrosive effect upon the greater population of America. Then that the Australian present elected political party and its complicit mainstream media accept then present the very same as to be the supposed World view of the way thins are said to be. Do please recall that it was the American mainstream media that was complicit in the greatest ever scam upon our World. The 9/11 Twin Towers tragedy that murdered the lives of those thousands. Please bear in mind that in my 60 + years in Australia I have witnessed the myriad of changes that lay in the negative side of the lives of all the Australian people.during all the years I have dwelt in our country. The present Liberal party are a hideous mob of opportunists, this is not an acceptable body of persons that Australia can any longer place any trust thereupon.